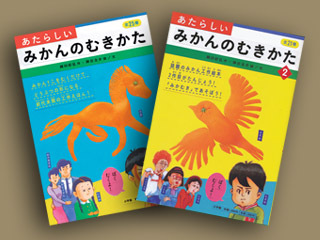 Since this book was published in 2010, it became a smash hit in Japan. It is easy to make by following the plans in the book. Since this art was introduced many times in mass media, it is said that one out of five Japanese knows about this art. One month after starting to sell this book, they decided to reprint this book. Also it wasin the 6th place in AMAZON.JP total ranking. This book is not made just as a craft book, but as a story book with pictures where Mukio is the main character, which was the idea of the editor. The story is that Mukio comes up with the idea of new ways of peeling tangerines, and by the encouragement of his family, he starts to create new designs one after another. 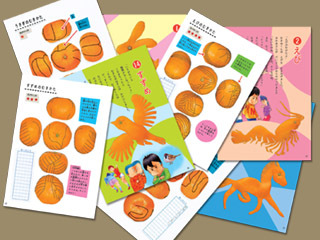 This book is not only for appreciating the art works, but also for making the art works by looking at the six photos of an orange with lines from six angles. This is so called a development of a sphere. If you are a science major, you may be interested in it. In fact, in 2011, this book was in the 5th place in the Tokyo University book store sales ranking in the section of the literature. *by the public twitter announcement by Tokyo University book store There is an explanation also about how to dry the peels and preserve them. Once the orange peels are dried, they can be preserved for good.